What Does the Ford Edge ST Have to Offer? 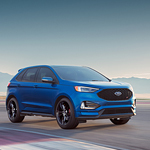 The Ford Edge has much to offer, and if you choose the Ford Edge ST, then you can get a number of features that enhance performance. At Corning Ford, it is important to us that our consumers are informed about our models, so we welcome you to read further to find out what the ST trim has to offer. The Edge ST is powered by a twin-turbo 2.7L EcoBoost engine. This engine can crank out 335 horsepower and 380 lb.-ft. of torque for impressive power. You also get a Performance Tuned Suspension for better body control, precise steering, and cornering capability. Ford Co-Pilot is also offered with the Edge ST. Ford Co-Pilot is a suite of driver-assist features that offer exceptional protection. With Ford Co-Pilot, you get Pre-Collision with Automatic Emergency Braking, a Blind Spot Information System with Cross-Traffic Alert, a Lane-Keeping System, auto high-beam headlamps, and a rearview camera.